The Thermaltricity retrofit PVT panel, has taken 3 yrs to develop with my Chinese investor partner in Hangzhou. The Australian business partner selected Thermaltricity International as the most interesting supplier of a solar thermal cooling panel, as he already invested 3.5 yrs ago in 28 LG 300 watt panels to be installed on his house roof, outside of Sydney. His house comes with a swimming pool heated by a heat pump, so the concept of taking the heat from the back of his 28 panels to offset the running of the heat pump during day times. As the inventor of the Thermaltricity solar thermal panel, available in kit form or assembled at the Hangzhou factory, separate to a PV panel or with a PV panel, all came about from a visit to Intersolar (Germany in 2007),and seeing a demo working PVT panel sample. This led me to use all my many years of solar thermal experience and knowledge to design a thermal panel without any copper tube as a low cost light weight retrofit. There is now a growing interest for solar PVT panels, across Europe, the USA and even some low quality ones from China, but until now the cost has been way to high, when the balance of the water heating plumbing and water storage parts are purchased from suppliers who sell to the solar water heating industry. The completed retrofit solar thermal panels I arranged to be shipped to the owner of this house in Australia from China in late 2017, is already transfering thermal heated water from behind the PV panels into his swimming pool at around 500-550 watts per panel (16-17kWh) a day during summer months. Over a two day period 7th-8th April 2018, with an outside temperature of 35c (now autumn in Sydney) the thermal water output into the pool was 93kWT with 45kW from PV supplying the electricity output into the grid. The business plan is to establish a licensing agreement with a monthly royalty payment based on the number of thermal panel kits are shipped to that country. For all of this to happen in 2018, I am open to hearing from such companies to discuss there needs. 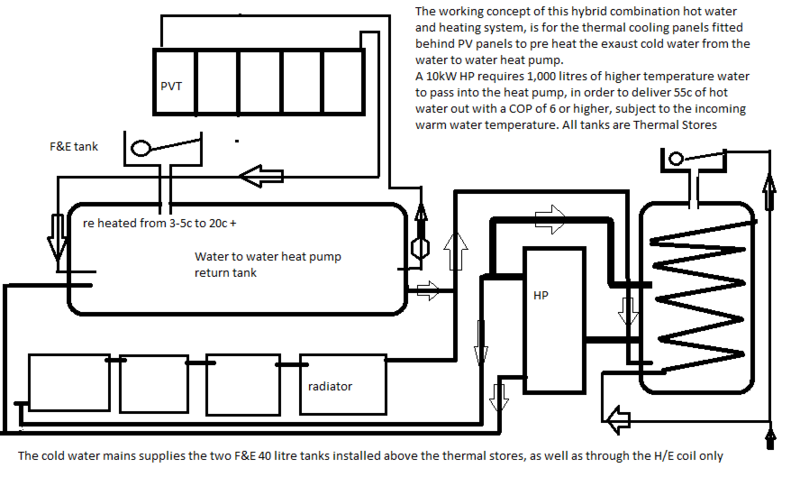 Our business plan, is to sell system kits, which can include the plumbing system, the PVT thermal water storage tanks, a ground source heat pump and the controller/pump circulating parts. The market focus is towards homes with swimming pools, as well as commercial, with enough space for the PVT panels needed. For the commercial market: fish farms, Aquaponics, Hydroponics, the food processing industry, breweries and hospitality industry from hotels to restaurants. I attended the first IEA SHC Task 60 PVT work shop in Freiburg, Germany from the 16th to 18th May, attended by up to 50 persons from the PV, Thermal PVT manufacturing industry along with representatives of research institutes, certification test centers and Universities across Europe.